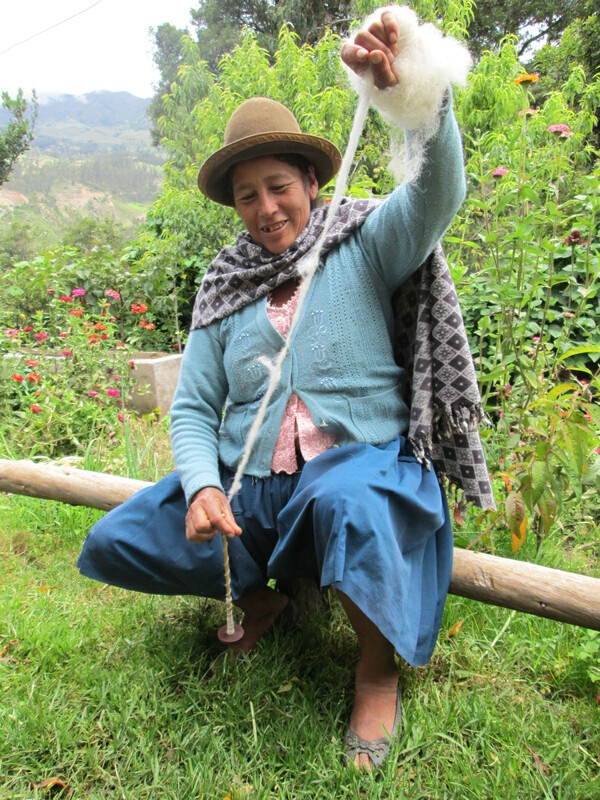 To date 6 spinners from Independencia Bolivia have signed up to compete in the Spinzilla spinning contest. 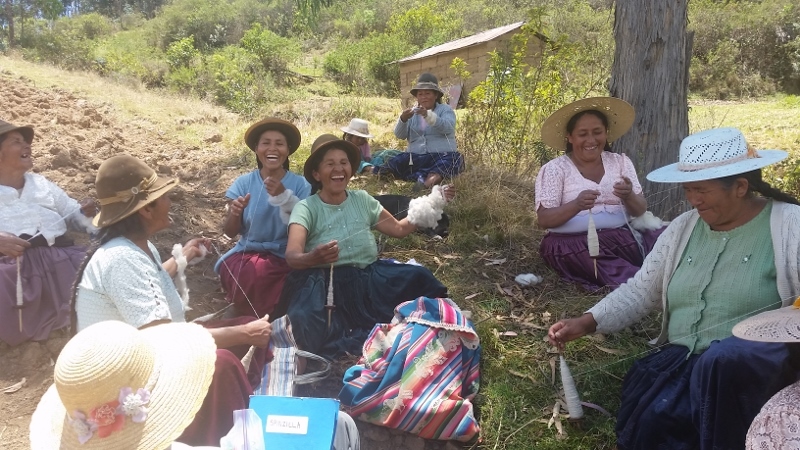 Thanks to our WARP (Weave a Real Peace) connections that the Andean weavers will be competing. At the 2013 annual WARP conference Irene Schmoller, founder of Cotton Clouds, showed me the Spinzilla website. Our excitement quickly faded when we read that the spinning contest would only be open to U.S. teams its inaugural year. Cotton Clouds sponsored a 2013 team so when we met up at the 2014 WARP conference Irene enthusiastically exclaimed that we had to enter this year because Spinzilla was going global. With help from Liz Gibson a WARP member, social media consultant, and Spinzilla organizer we partnered with Cloth Roads as our TNNA (The NeedleArts Association) sponsor. Marilyn Murphy, one of the Cloth Roads founders and a WARP member, met Doña Máxima, our team captain, at the Tinkuy International Weaving Conference in Cusco last November. 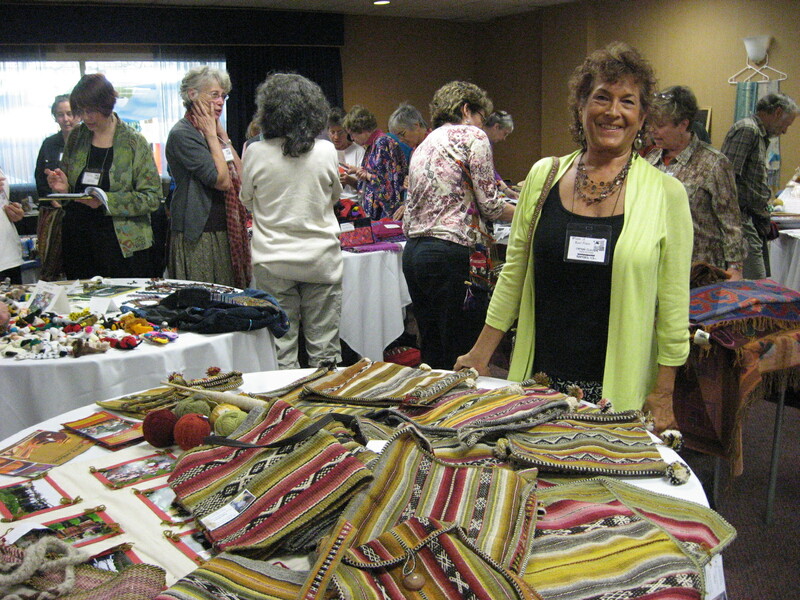 Cloth Roads has purchased weavings from us at the WARP Marketplace to sell through their gorgeous online marketplace. Make a note of their website for gift shopping when you wish to make a socially conscious purchase of exquisite handcrafted items from cultures that are sadly on the wane. 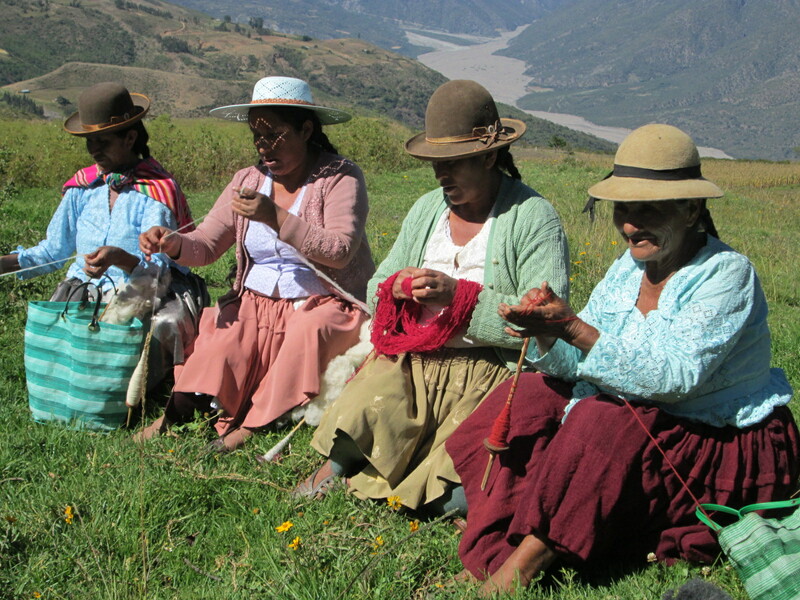 The majority of the Independencia Spinzilla team will be women from the rural community of Huancarani. They spin and ply with a drop spindle while pasturing their sheep daily. Be warned that they are “professional” spinners and will be formidable competition. Take responsibility for spinners who wish to participate but don´t leave their farms and pastures. This was included to accommodate the elder spinners. Club de Artesanas members Adviana and Vilma reluctantly decided it wasn´t practical to join the team, but both asked to be responsible for relatives. Nineteen year old Adviana has her hands full with a year old daughter who becomes more mobile daily and 3 year old Jason. 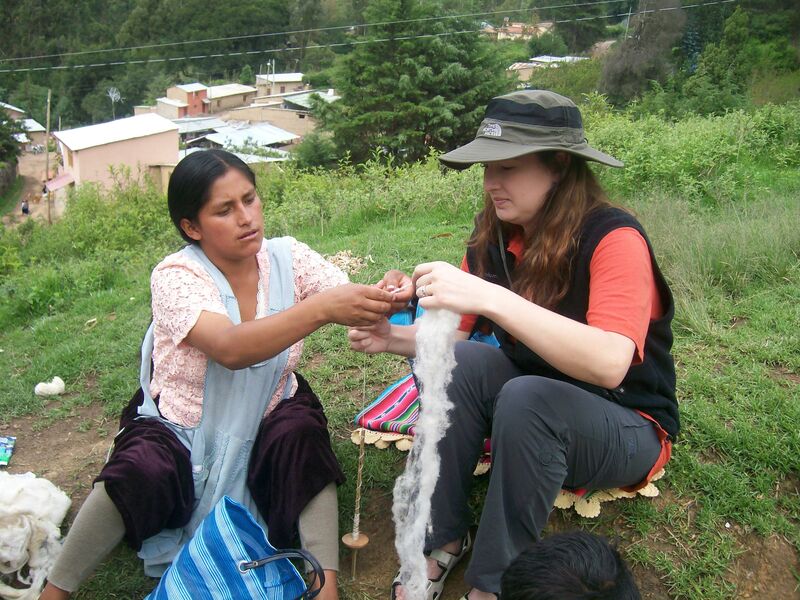 She said that her grandmother, who helps her with her weavings, wished to participate. Vilma has 4 kids under the age of 8, mountains of laundry to hand wash daily, and a small store to run. She asked if her mother-in-law could take her place. Absolutely! The women have discussed what to name the team and settled on Warmis Phuskadoras/Cloth Roads. “Warmis is Quechua for “Women”. 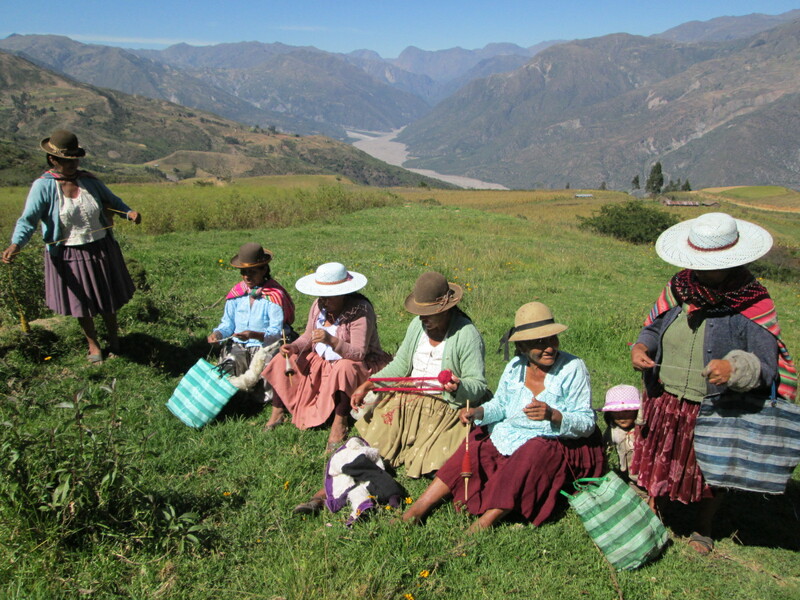 Phuska is Quechua for drop spindle, and the “doras” part is a bit of Spanish indicating females doing the spinning. There are Andean men who hand spin, much to Doña Máxima´s amazement while in Cusco, but they don´t spin in this area.